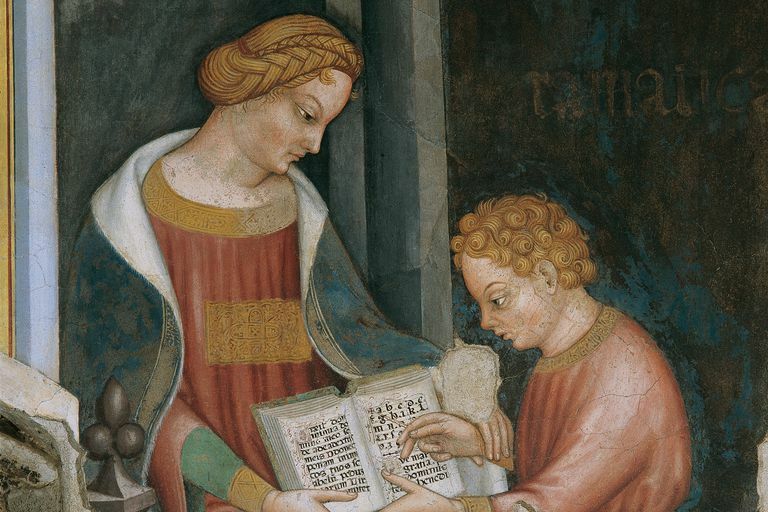 Arithmetic Personified: a female figure teaches arithmetic to a young boy. Renaissance fresco, Gentile da Fabriano. Mathematics as a field of science or philosophy was largely closed to women before the twentieth century. However, from ancient times through the nineteenth century and into the early twentieth century, some women were able to achieve notability in mathematics. Here are a few of them. Hypatia of Alexandria was a Greek philosopher, astronomer, and mathematician. She was the salaried head of the Neoplatonic School in Alexandria, Egypt, from the year 400. Her students were pagan and Christian young men from around the empire. She was killed by a mob of Christians in 415, probably inflamed by the bishop of Alexandria, Cyril. Elena Lucezia Cornaro Piscopia, from a fresco in Padua, Bo Palace. Elena Cornaro Piscopia was an Italian mathematician and theologian. She was a child prodigy who studied many languages, composed music, sang and played many instruments, and learned philosophy, mathematics and theology. Her doctorate, a first, was from the University of Padua, where she studied theology. She became a lecturer there in mathematics. A writer and mathematician of the French Enlightenment, Émilie du Châtelet translated Isaac Newton's Principia Mathematica. She was also a lover of Voltaire and was married to the Marquis Florent-Claude du Chastellet-Lomont. She died of a pulmonary embolism after giving birth at age 42 to a daughter, who did not survive childhood. Oldest of 21 children and a child prodigy who studied languages and math, Maria Agnesi wrote a textbook to explain math to her brothers, which became a noted textbook on mathematics. She was the first woman appointed as university professor of mathematics, though there's doubt she took up the chair. The French mathematician Sophie Germain studied geometry to escape boredom during the French Revolution, when she was confined to her family's home, and went on to do important work in mathematics, especially her work on Fermat's Last Theorem. Known as the "Queen of Nineteenth Century Science," Mary Fairfax Somerville fought family opposition to her study of math, and not only produced her own writings on theoretical and mathematical science, she produced the first geography text in England. Ada Lovelace from a portrait by Margaret Carpenter. Ada Lovelace was the only legitimate daughter of the poet Byron. Ada Lovelace's translation of an article on Charles Babbage's Analytical Engine includes notations (three-fourths of the translation!) that describe what later became known as a computer and as software. In 1980, the Ada computer language was named for her. Raised in a supportive family that encouraged her education, Charlotte Angas Scott became the first head of the math department at Bryn Mawr College. Her work to standardize testing for college entrance resulted in the formation of the College Entrance Examination Board. Sofia (or Sofya) Kovalevskaya escaped her parents' opposition to her advanced study by a marriage of convenience, moving from Russia to Germany and, eventually, to Sweden, where her research in mathematics included the Koalevskaya Top and the Cauchy-Kovalevskaya Theorem. Alicia Stott translated Platonic and Archimedean solids into higher dimensions, while taking years at a time away from her career to be a homemaker. Called by Albert Einstein "the most significant creative mathematical genius thus far produced since the higher education of women began," Noether escaped Germany when the Nazis took over, and taught in America for several years before her unexpected death. How Did Sofia Kovalevskaya Contribute to Mathematics?